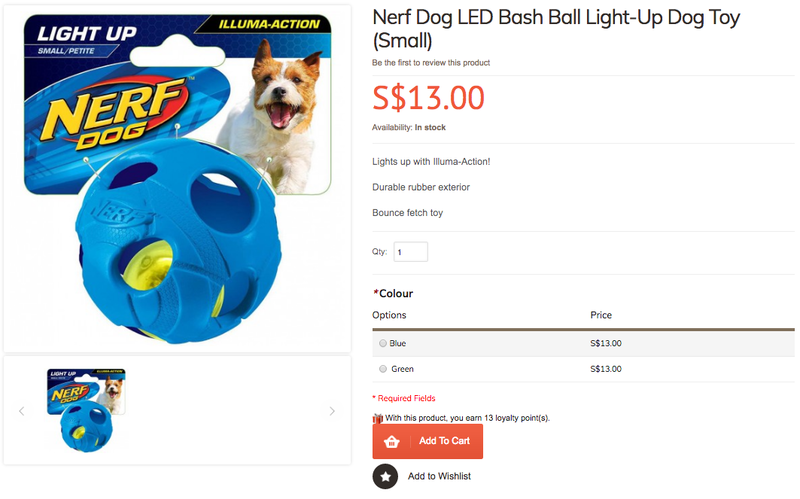 With the speed of light and my sharp catching skills, we I have decided that the second toy review shall be the Nerf Illumina Light-Up dog toys. This was going to be my first review and I started writing up a little then a long came goondu Frodo's birthday and Mr Wubba jumped the review queue. SO! I have never heard of the Nerf brand. It was with many thanks to Ms U from Kohepets who recommended the NERF Ball Blaster to us that piqued my blonde interest in NERF toys. I had already selected the toys I wanted (including the Ball Blaster) and with a bit more budget available, I spent about two days deciding what other toys to add on to my shopping cart. As you might already know by now, those cutesy plush toys will never make the Flapper-cut. Those cutesy plush toys are for human interests of going "awwww so cute" but it will not survive my monster mouth. Period. I was honestly getting a bit frustrated combing through the store for toys. Like seriously, how difficult can it get to find toys... for dogs? I mean sensible, playable, usable and affordable toys. Not those cutesy plush type but exciting fun toys that we can chase and run after, catch, fetch... whatever! So I decided, what the heck! Let me just choose something from NERF! If they can create a Ball Blaster, surely I can get something else from them and surely their quality couldn't be too far off! 21 toys from Nerf of which many of them looks similar. Then I looked at mummy and said, "Remember you bought me that plastic light ball many years ago from the U.S. and I used to go gaga over it but you hated it because it is very plastic-ky? How about getting Frodo and me one of those LED light-up toys from NERF?" What I did not tell mummy was, the true intention for getting the LED light-up toys was to sneak night playtime. Mummy is easy to manipulate. Give her a good fun toy and she is no different than us. She loves play time too... never mind she has reading glasses already. So mummy caved in and decided to get both the Light-up ball and barbell for us. She wanted to see which toy we responded better to and I have always loved retrieving barbells so let's see how this fares! With NERF Illumina Action Bash Ball and Barbell in the shopping cart, my toy shopping was complete. Three days later, ding dong! The toys arrived at our doorstep. Mummy and I excited took photos of our Kohepets toy loot and erm... no need to guess. The first toy we tested was the Nerf Ball Blaster but it will be our last review. Saving the best for last. 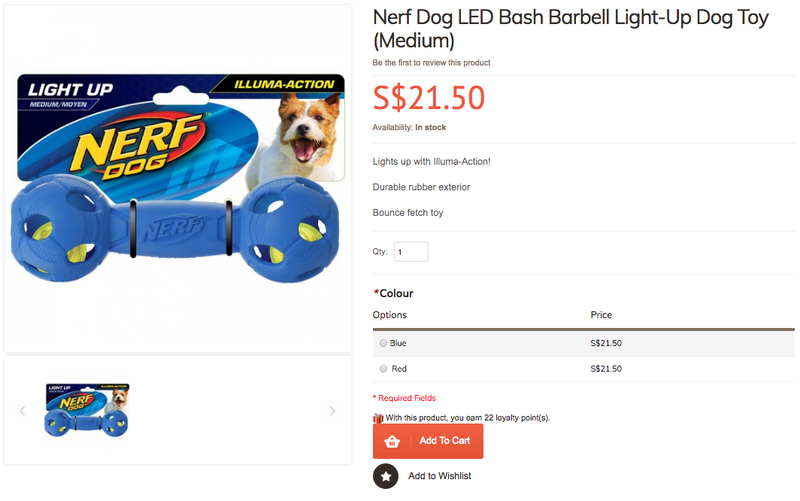 Anywoof, while we were testing the Ball Blaster was when we started to hear whispers of "Nerf? NERF? They make dog toys? Is this for human or dogs?" Mummy felt a little embarrassed. How is it that everyone else has heard of NERF but mummy? She heard those excited "foam balls" "paint balls" whispers but is NERF really such a big brand? Nerf (trademarked in capitals as NERF) is a toy brand created by Parker Brothers and currently owned by Hasbro. Ok! Now I know who they are. NERF Dog - In June 2013, Hasbro and Grammercy Products unveiled Nerf Dog, a line of Nerf-inspired canine retrieving toys made of rubber, nylon and plastic. 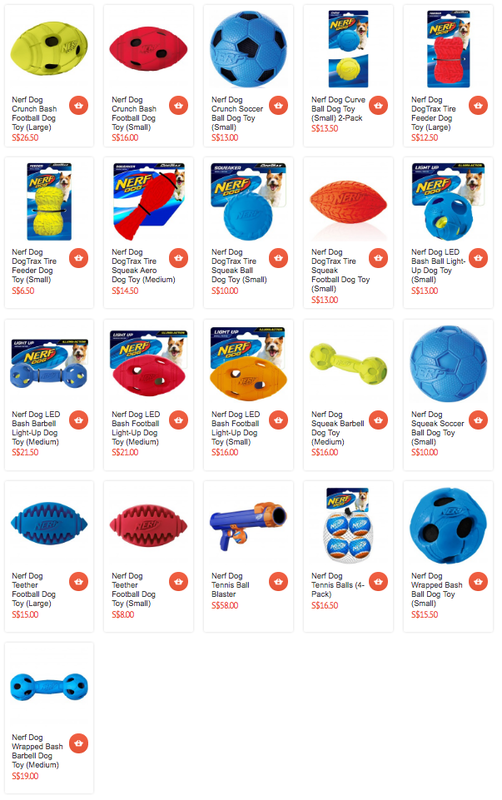 Nerf Dog was launched at Walmart stores, and debuted at pet specialty stores in Fall 2013. Ah! Okay.... I feel a bit smarter again. Whatever or whoever NERF is, bring on the bling mama! NERF Illumina-Action Toys.... Of course I had to let the blings out. As mentioned above, the whole "NERF" thing was very new to me. And based on the product images, I was not sure what the material was. I was hoping and praying it was not made of some plastic-ky material. Mummy, with her crappy sense of humour, said to me, "Well Flapper, if it's some cheap-s*** plastic material, we will just play light-up sepak takraw." It reads "durable rubber exterior" on the product description. Clearly she forgot to wear her reading glasses. The good part about being so new to NERF toys is that no expectations were set. I really did not know what to expect in terms of it's design, quality and durability. For one, with the overall price point of NERF toys, I did have my reservations about the quality of the toys. The toys are not Taobao/Ezbuy cheap but affordably priced on regular dog products retail price point. So based on the price points, I was none-too-confident about the quality. The 'Illumina' Bash Ball (SMALL) is priced at SGD13.00 which is very reasonable for a doggie bling ber-bling ball. NOTE THE SIZE OF THAT INNER YELLOW BALL.... The product image is not accurate to the actual size (explained more see below). Anything above $20 for a throw-toy starts to feel a bit ouch but just because it blings and I love barbells, I had to get this to try to see if I would really love it. Despite my initial skepticism, the quality of NERF toys turned out way better than I expected. I have to credit the creators as it is clear that good thoughts have been put in to produce practical PLAY-ABLE toys. Meaning.... neither Frodo nor I are going to break the toys any time soon. I call them, REAL TOYS. Real toys for real dogs. The ball actually quite small in my mouth so I had to go measure it! It was surprisingly the same size as a tennis ball! Optical illusion.... I assume. The Barbell is quite heavy (by dog's standard) which some dogs may not appreciate fetching it. You might be wondering why am I obsessively measuring the size and weight of the toys. The reason is simple. The size and weight are determining factors of its suitability for different dogs. A smaller dog may not appreciate the weight of the Barbell or if a ball is too small and/or flimsy, a big dog owner will frown due to the dangers. 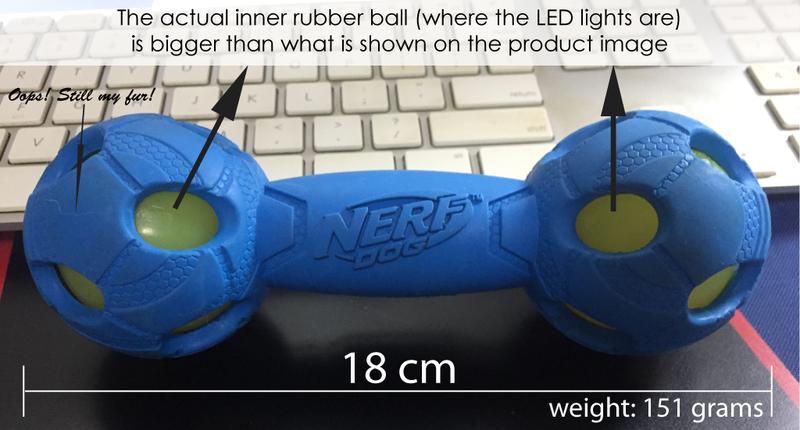 So for my review, I do try to provide as much information as I can about the toy for other dogs/owners to have an idea of its dimensions and suitability before purchasing. After all that blah-blahs above, time for us (Frodo and me) to LAB-Test the toys. The human can shake it to get it to light up - on this note I must say that the Barbell lights up easier on one side. Maybe mine is slightly faulty/wonky... I don't know! You can throw it/bash it on the ground and ber-bling ber-bling. 3 ber-blings - Red, Blue and Green. This first test was super fun. We started playing from early evening till nightfall. The first test while we still had daylight vision, was to see how we liked the feel of the toys and whether it was 'fetch-able'. It did not take long before we - Frodo, Mummy and myself - decided the ball was the preferred choice. we could play toss-and-catch with the ball. The other test was just to see how the ber-bling looked under different lighting condition. And... to test how well my Sony Action Cam can capture our Light-Up toys especially in the dark. I must say.... it was actually a lot darker than what the video projected. But I was overall still very happy by what we managed to capture in this first test. And my poor 'Usain Bolt' brother could not withstand the duration of our toy test. We actually tested the KONG Zinger (my next toy review) prior to the light-up toys so erm yeah... he ran out of stamina by the time we got to the NERF 'Illumina' toys. to show off my new toys... and my impressive old man moves. Goes without saying, that called for Bash Toys #LAB-Test No. 2 - Long-Exposure Photography Pawtography. Long-exposure, time-exposure, or slow-shutter photography involves using a long-duration shutter speed to sharply capture the stationary elements of images while blurring, smearing, or obscuring the moving elements. Long-exposure photography captures one element that conventional photography does not: time. The paths of bright moving objects become clearly visible. Clouds form broad bands, head and tail lights of cars become bright streaks, stars form trails in the sky and water smooths over. Only bright objects will form visible trails, however, dark objects usually disappear. "Dark. I need a very dark place. Almost no light. ", I heard Uncle Nic mumble. As mummy had no clue what this long-exposure photography is all about, she proposed trying indoors first so she gets an idea of what Uncle Nic is trying to achieve. Please excuse Pebbles' smelly duvet that is hung at the window. We had to block out the light that was coming through that window. To get the desired light trail, mummy had to light-up the toy before throwing to capture the trail coming in, our mis-catch point and the bounce trail thereafter. AND! Believe you me, the place was PITCH DARK when we tested these shots. That's Phantom Frodo being the #LAB-Test subject. Check out the pretty light trails from the Bash Ball! This long-exposure pawtography is so fun! I can see where Frodo missed the ball and the ball bounce thereafter. Super cool! And this is Phantom me in action.... This is soooo cool. So there's a phantom of me jumping up to get the toy, I missed it and my phantom trail chasing after the ball. And that's Phantom me again... with Phantom Frodo standing at the side wanting to join in the fun. After that oh-so-fun indoor long-exposure test, we proceeded outdoors. That was when the ball-bashing began as mummy whacked the ball pretty hard against the wall to test on how to get the desired bounce-effect for the shot. It did not take long before Uncle Nic noticed the red light was not showing up! More ball-bashing. Got to get red-light out. Some times the red light appeared. Most of the times it did not. Bash-Ball red light was a goner. We only had blue and green lights left which did not give as nice an effect without the red lights. At the start when red light was still alive... a whole mess of lights here compliments of my bad off-the-wall catch. It was not as dark outdoors so it did not have as nice an effect as indoors. I can barely make out Phantom-me here. The demise of red light.... no more red might. I think mummy did a bad throw here. There's a glob of green light above me. Haha! I can't tell if that's Frodo or me..... Nice light trail lines, just very bland with primarily green light. And this is Phantom-Frodo. The odd moment the red light appeared before it completely RIP. And the red light officially found the grave. The ball either hit Phantom-Frodo or he caught the ball. Truth be told, Frodo with his odd eyesight actually fared better catching the ball in the dark than I did. Hoorah Frodo! Sometimes, a simple brainless ber-bling toy may just end up being the source of inspiration for the photographer. I'm giving it 3 Flaps because I don't mind retrieving it and I do use Barbells for Dog Assisted Therapy purpose. Frodo is giving it 2 Doh-Ahs because other than stealing the barbell to chew, he does not like retrieving it. It's a tad bit too heavy for him. For the quality, SGD21.50 is decently priced. But for the limited usage, I would go for the SGD16.00 Squeak Barbell instead. I think I would favour squeak over light for the Barbell. Thus 3 Flaps from me. The iffy light-up (have to shake it vigorously a few times) on one side of the Barbell is quite annoying thus 2 Flaps from me. It does light up effectively on its own when thrown on the ground. We have not abused the Barbell the way we did with the Ball so the red light is still alive. No denying, the rubber quality is good and is still looking good despite having gone through my monster-mouth. No doubt about it, NERF toys' quality is good. Would We Buy This Again? Absolutely not. Not a Barbell fan. That's Flapper's thing. Love love love the Bash Ball... and it lights up! The weight slows the bounce down which makes it easier to do impressive off-the-wall catch in comparison to a tennis ball. And that long-exposure pawtography.... LOVE IT! 5 full Flaps from me! Simple fun. Ber-bling. Me-love. Fits in my mouth. Can chew. 5 Doh-Ah from me! Priced at SGD13.00... and we had so much fun with it. Yes! 4-Flaps from me. Minus 1 Flaps because the red-light died a tad bit too quickly. The red-light died too quickly (3rd use) so 3-Flaps from me. The light was otherwise responsive and no complains about its effectiveness. For 13.50, the quality exceeded expectations. As tiny as the ball looked, it was designed and created for real dogs = no worries about rough use and monster mouth. Again... THAT RED LIGHT! YEEEEEESSSSSS!!!! One more, two more... also can! 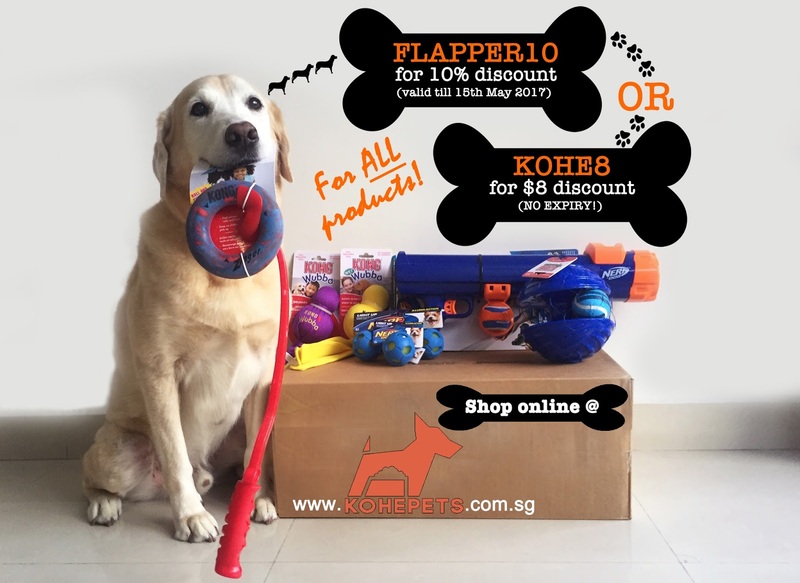 Kohepets Promo is still on! Happy Shopping!